Trump had dismissed forceful pleas from the FBI director, Christopher Wray, and the second-ranking Justice Department official, Rod Rosenstein, to keep the memo under wraps. They said the four-page document was inaccurate and lacked critical context, and they made their views known in a remarkable public statement objecting to its release. 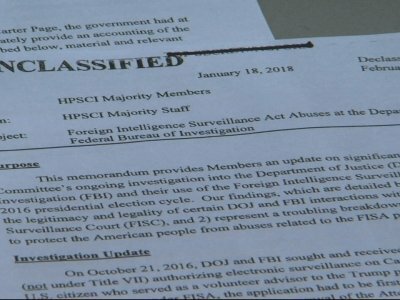 Democrats said the memo, which disclosed material about one of the most tightly held national security processes, selectively used Republican talking points in an effort to smear law enforcement. Trump’s counsel, meanwhile, took issue with the House process. Don McGahn believed that if the president only allowed the memo to go out, rather than declassify it, that would set a dangerous precedent and curtail executive powers, according to a White House official. “The top Leadership and Investigators of the FBI and the Justice Department have politicized the sacred investigative process in favor of Democrats and against Republicans - something which would have been unthinkable just a short time ago,” the president tweeted on Friday. Trump first asked Comey for loyalty before firing him. He repeatedly berated Sessions, publicly and privately, after the attorney general’s decision to withdraw from the Russia investigation, and railed about what he perceived as insufficient loyalty while urging the Justice Department to reopen its investigation into Hillary Clinton’s emails. He reportedly asked the FBI’s No. 2 leader, Andrew McCabe, which presidential candidate McCabe voted for in 2016 and targeted the deputy director for attack in the weeks before McCabe announced a sudden departure from the bureau. This story has been corrected to reflect that the last name of the White House counsel is McGahn, not McGhan.